Provide comfort for the family of Suzanne Gombik with a meaningful gesture of sympathy. Big sister, loving wife, mother, Matante, Grandmaman, best friend and great host to all who were ever lucky enough to be invited to the cottage or her house for a holiday dinner, Sue was loved by all. 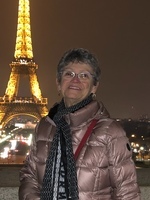 Whether it was her caring for her patients as a nurse in Timmins, Alban and Noelville, or her regular sharing of crafts, recipes, and a shoulder to lean on, Sue was always thinking of you first and never wanted to put others out. She was curious, passionate and generous and will be missed by all who knew her - young and old. Predeceased by her husband Laddie Gombik, Suzanne was the proud and loving mother of Les Gombik (Cathy) of Calgary AB and Casey Gombik (Amanda) of Squamish BC. Loving grandmother of Frank and Oliver. Suzanne is survived by her brothers Paul Lauzon (Lise) and Gilles Lauzon (Kate) of Lillouet BC, Roger Lauzon of Sarnia, ON and her sisters Ginette Croteau (Pierre) of Sturgeon Falls, ON,), Rachelle Cousineau (Leo) of North Bay and Nicole Coker (Greg) of Sarnia ON. and her Step Mother Leona Lauzon. There will always be a piece of her in our hearts. Donations to the Canadian Cancer Society are welcome and appreciated.